Fira, the main town of Santorini, has always been the busiest point of the island. 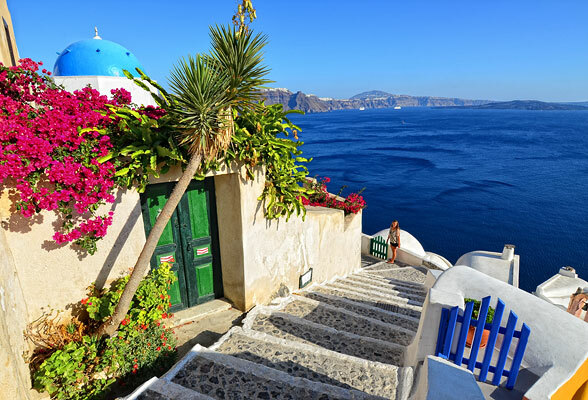 Perched on top the highest cliffs of the caldera, Fira attracts thousands of tourists and, as a result, it is the most densely built part of Santorini. On our first Santorini holiday almost ten years ago, we stayed in Fira at the Porto Fira cave hotel. We came in search of our old hotel only to find that the main town centre is now concentrated about two levels up the cliff-side from where it was previously. Our quaint and humble little cave hotel is now the upmarket Porto Fira Suites, with jacuzzi, swimming pool and all. There is no need to climb the 588 steps from the old port area to the main Fira town centre as a cable car now links Fira to the old port where many of the cruise ships disgorge their passengers. Theotokopoulos Square, the main meeting place of the locals, overflows with shops and cafes. There are so many jewellery stores that there is a street named Gold Street. Bars, pubs and discos now cater to the younger crowd who want more than just the spectacular panoramic views that Fira has to offer. No matter which direction you walk, the narrow cobbled streets and alley ways are packed with gift shops aimed at the tourist market. The Archaeological Museum of Thira holds collections of sculptures and inscriptions from the Archaic to the Roman period. There are also vessels from the Geometric up till the Hellenistic era. When visiting the Museum of Prehistoric Thira you will get into the spirit of the civilisation that developed at Akrotiri and admire the indelible colours of murals which remain in tact under the lava. The Bellonias Foundation, the cultural centre of the island, stands out with its ochre and cypress green colours. And, the Gyzis Mansion has copper engravings from the 16th – 19th centuries depicting scenes from local daily life. At the Santorini Orthodox Metropolitan Cathedral are wonderful religious paintings created by the Santorinian painter Christoforos Asimis when the church was built, following the earthquake of 1956. The Catholic Cathedral, with its architecture and steeple, is impressive. In the Folklore Museum, you can see a cave with the layers of lava deposits from the volcanic eruptions, as well as an authentic “kanava”. From Fira you can take the cable car to go down to the old port area. Or if the height worries you, you can take a ride on a donkey or for the extremely energetic, walk down the 588 steps. Fira is less crowded in the morning so to avoid the crowd, it would be better to visit in the morning. Fira has a large range of accommodation types, from the budget studios to cliff-side villas, suites and resorts. You can see the list of Fira accommodation and make your Fira hotel booking Here. If you are arriving by ferry, there are regular buses running from the new port area to Fira and the one way fare costs €2.20. From Oia, there is a local bus which connects Oia with Fira and the one way fare is €1.60 (September 2011). Participate in the conversation by leaving your comment below.